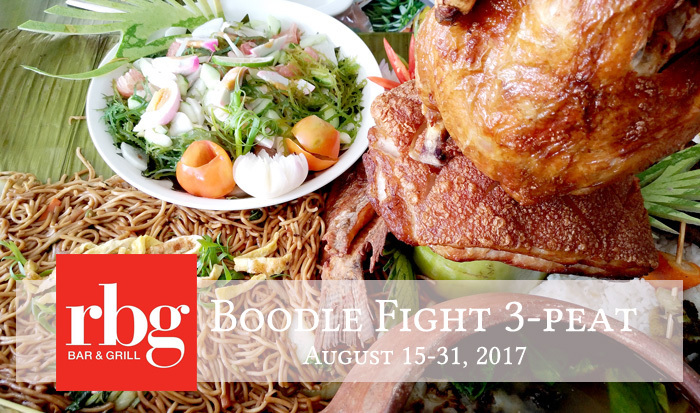 The Boodle Fight 3-peat Meal is priced at Php2,999 net per set and it’s good for 8-10 persons. Its available daily from 11.30AM to 10:00PM beginning August 15 to 31, 2017. 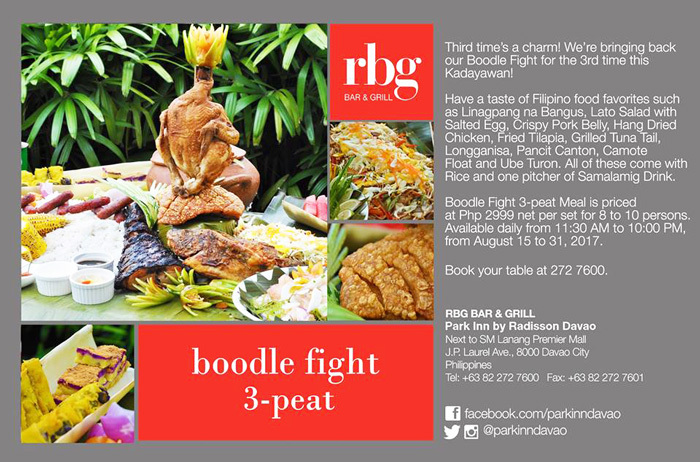 RBG Bar and Grill’s Boodle Fight is back for the third time! I can’t believe it’s been three years already. I was one lucky blogger I was with RBG the first time this concept was launched in 2015 and it was so successful it did a repeat the following year. Without a doubt, it was a well-received concept that RBG is launching it again this Kadayawan 2017. “We are bringing back the popular boodle fight for the third time. This time with even more dishes to enjoy. Our launch is basketball themed and we rode on the popular 3-peat. It’s the 3rd time that we are having the boodle fight since 2015. We’d like also to make this a big splash as a take-off for our Kadayawan Celebration,” said Hotel Manager, Ms. Evelyn Rosales. 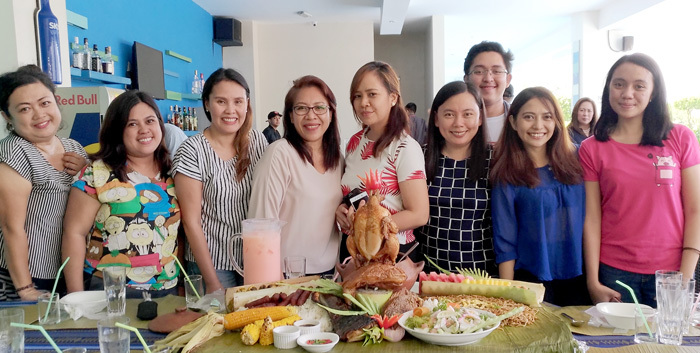 RBG Bar and Grill Boodle Fight! 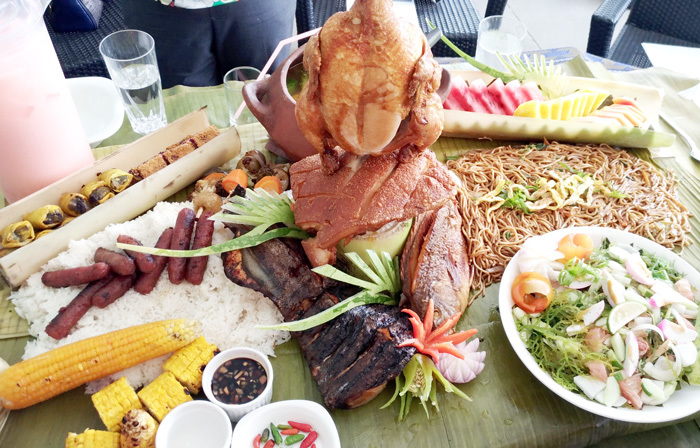 All-time Filipino favourites will be the star of this year’s boodle fight spread. For the soup, there’s the old-flavour of home, Nilagpang na Bangus served hot in a clay pot. For the salad, fresh Lato with Salted Eggs. The main course comes with irresistible Crispy Pork Belly. My ultimate favourite, hang-dried Chicken, Fried Tilapia, Grilled Tuna Tail and tempting Longganisa completes the list. The sidings are a full meal in itself too. The Pancit Canton is truly a treat. You had me at Pancit Canton, Chef Teng! It’s so good. There’s also Grilled Corn, Grilled Vegetables Skewers and a heap of Rice. Who said I’ll go slow with carbs? Well, not on this table, not on this occasion and not on this fight! The desserts are equally sensational. There’s Camote Float, which by the way, my first time trying and it’s actually so good. The Ube Turon is just as exceptional, sweet and soft on the inside and crispy on the outside. Each set comes with a pitcher of Samalamig Drink and a generous helping of Mixed Fruits. Prosperity pose before the fight! Laban lang mga, besh! Thank you Park Inn Radisson for having Davao Digital Influencers! So bring the whole team, family, friends and celebrate the flavours of home this KADAYAWAN at RBG Bar and Grill. Call (082) 272 7600 or email fb.supervisor@parkinn.com to reserve a table today!